Recently, the gum-makers Stride and Trident have created varieties of gum that are fortified with vitamins like B6, B12, vitamin C and herbs such as ginseng. Its seems as though they have been taking notice of the marketing trends of “energy” drinks that promote some of the same ingredients along with claims of increasing awareness and energy. While these gums, Stride Spark and Vitality, don’t make any particular health claims their names at least s uggest they may provide a boost in energy or alertness. If you simply like chewing gum, which many of us do, than this could be something you might just enjoy regardless of the ingredients fortified within it. But if you’re looking at this gum as a source of vitamins or energy enhancement, you’re looking in the wrong place. Simply put, it’s still best to count on gum to freshen your breath and not much more. 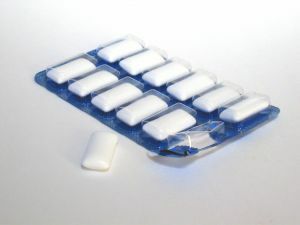 The vitamins infused in these gums are found in so many commonly eaten foods. If you want to get your daily dose of the B6, B12, and vitamin C try these foods which can be part of a well-balanced diet. This vitamin has many roles within the body including protein and red blood cell metabolism, as well as ensuring the proper functioning of our immune and nervous systems. Foods high in B6 include fortified cereals, bananas, beans, chicken and pork. Vitamin B12 plays a role in DNA synthesis, fat and protein metabolism, and red blood cell formation. B12 is naturally found in animal products, foods high in B12 include meat, fish, eggs, milk and milk products like cheese and yogurt. Vitamin C is important for wound healing, immune function, and protein metabolism. Foods high in this vitamin include mostly fruits and vegetables like red pepper, oranges, broccoli, strawberries, and tomatoes. Newman, Andrew Adam. “Stride and Trident Gums, With Herbs and Vitamins – NYTimes.com.” The New York Times – Breaking News, World News & Multimedia. N.p., 8 Feb. 2011. Web. 4 Mar. 2011. ← Breast Milk Ice Cream, Anyone?